Garbh Allt is on the map! The Garbh Allt Directors are delighted to announce the completion of the land sale. 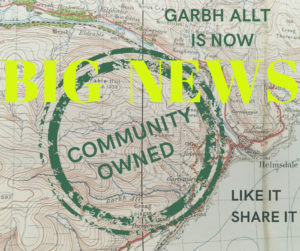 Garbh Allt land- 3000 acres across Portgower, Gartymore, West Helmsdale and Marrel- is now in COMMUNITY OWNERSHIP. How wonderful that this has happened.- because you all made it happen. Very many congratulations, and best wishes for the really hard work ahead in keeping the project buoyant into the future. We hope to be joining you, having just moved nearby. Many thanks Kathy, welcome to the area – exciting times ahead.